Hands in the Garden | Love Those "Hands at Home"
Isn’t she lovely? She and her sister blooms stop me in my tracks every day, in sheer admiration. They look so out of place, these lush tropical-looking beauties. How does something this extravagant, this opulent, this voluptuous dare grow in Zone 4, in upstate New York, a few miles from Canada? I don’t even remember where the plant came from but my guess is that my husband brought it home from the deep-discount rack at the big box hardware and garden center. He regularly brings home nearly-dead plants—waterlogged marigolds, root-bound daisies, dry-as-dust coleuses. Some we save, some are already dead and just don’t know it yet. 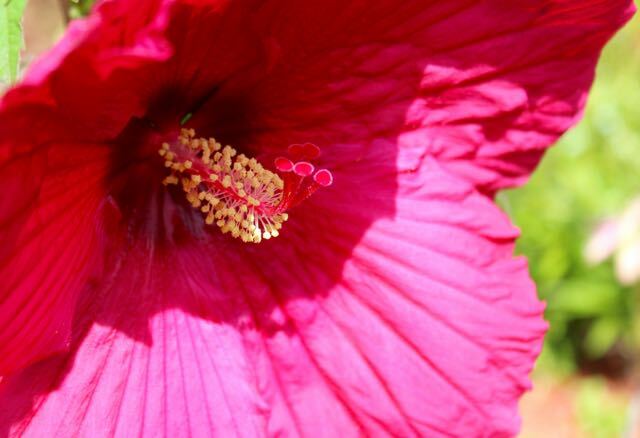 The hibiscus lived! It bloomed last summer and then looked really, really dead after our long, nasty, icy winter. But like a colorful, vibrant phoenix, rising from ice instead of ashes, it came back. 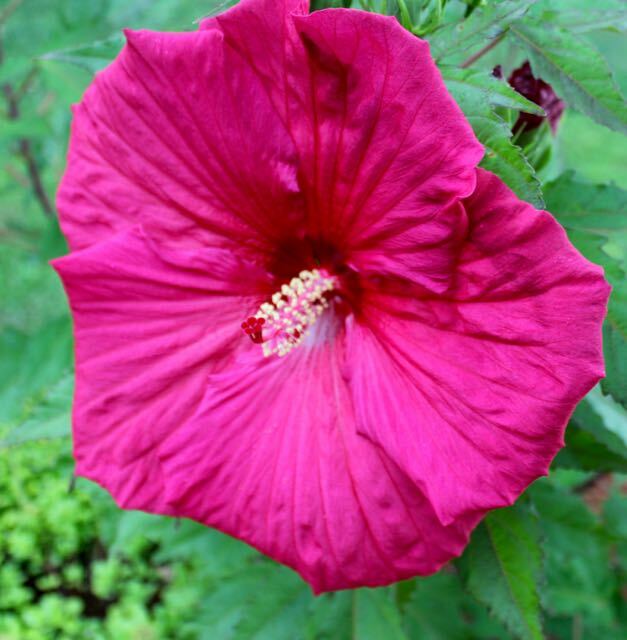 I have to admit, as pretty as they are, I’m not entirely comfortable with the hibiscus blooms. They’re so . . . showy. They make me think of those girls and women I’ve known who love attention and love to show off their amazing looks. The ones who wear the low-cut tops over their fabulous figures and lots of make-up. They pluck their eyebrows all the time, and do their nails, and always look perfectly turned out for every occasion. They’re even pretty when they cry. I’ve always been suspicious (and envious!) of that. I feel more comfortable with the geraniums and hostas in my little garden. Like me, they’re more traditional and homey. The hostas, in particular, are happy in the shade and don’t really need people focusing too much attention on them. That’s how I feel, too. I am uncomfortable with bright colors and with looking like I’m trying too hard. I can relate to the hostas! The only thing that reassures me about the flashy hibiscus is how short-lived its gaudy blooms are. One day, they’re all done up in total perfection—seductive and impossible to ignore. But the next day, each bloom has drooped and faded. Their petals look like a skirt that’s lost its starch or maybe a bouffant hair-do that’s come undone. Maybe they simply had too much fun on their one-day-long coming-out party and have a wicked, final hangover. I tell myself that we, the hostas and I, hold up better in the long term. We’re not drop-dead gorgeous but we are sturdy and constant and slow to fade. The garden needs us. 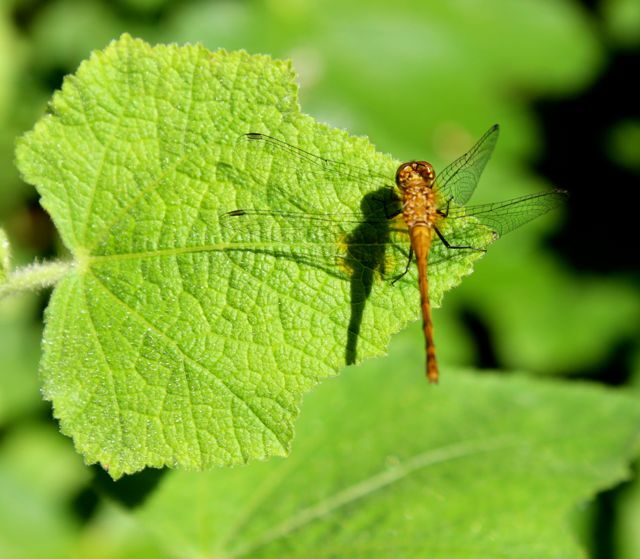 In fact, I realize, my garden is big enough for, and benefits from, all of us—the stately and the understated, the hot and the cool, the extroverts and the introverts. I’ve also learned, across the years, that the prettiest can be the pleasantest, the flashy exterior can contain an interior of integrity and strength. 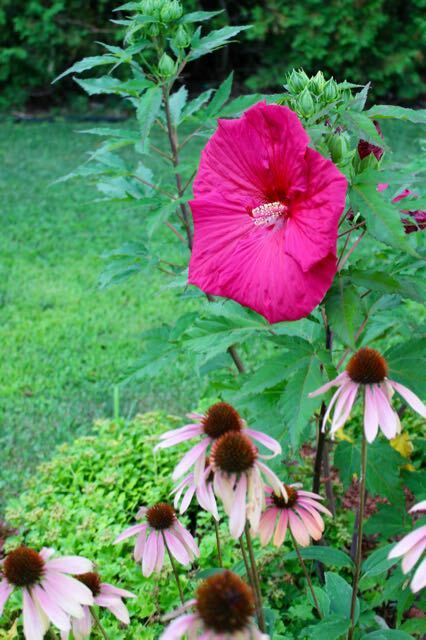 After all, the hibiscus plant can withstand temperatures well below freezing and come back strong, even if its blooms don’t last for long. So, I’m rethinking my anti-hibiscus prejudices and committing myself to a more open-minded garden policy. Bring on the showy and flashy, those that live fast and fade soon. We welcome you and your vibrancy to our understated world. We balance, and complete, each other. I almost always have one song or another running through my head. Often it’s something silly and annoying, like Roger Miller’s “England Swings Like a Pendulum Do” or “Waltzing with Bears,” which was apparently written by Dr. Seuss. He should’ve known better. In the song, Ochs lists the things he won’t be able to do anymore “when I’m gone” and concludes, “So, I guess I’ll have to do it while I’m here.” He itemizes the things we take for granted and put off and say we want to do, but shy away from, and reminds us that our time here is not limitless. I’ve been in the sunshine, raking last fall’s leftover leaves, and finding tender-green new growth beneath. I can recognize that these will be peonies and those will be heuchera, when they’ve had a few weeks to grow. I’ve been on my knees weeding, feeling muscles glow and tell me that no, I did not stay fit over the winter, but I can be soon. On my whim, I’ve moved from yard work to old linens, and spent time reclaiming them from years of neglect in storage, returning them to beauty, and finding new homes for them. When the spirit moves, I’ve wandered to my weaving, to wind warp for a gift and to help my husband figure out a new-to-us loom where he’ll make something beautiful out of ordinary string. I‘ve stopped by here and visited with you. I’ve shared a meal with dear friends. I’ve watched my cats nap in the sunshine and dive headfirst into piles of leaves, older cats made young again by springtime. I’ve heard geese honk on a lake of lapping water (not ice! ), watched the weeping willows turn green-gold as they bud, and smelled the sun on pine needles. These days are much of a muchness. Nothing wild or crazy or exotic or thrilling. But, these are my dances of delight. Full of anticipation and promise, hard work, productive and varied, but unpressured and mellow. I’m very aware that this won’t last forever. Things change. Complications arise. Nothing gold can stay. But, right now, it all seems so delightful. I won’t be able to dance these delights when I’m gone, so I guess I better do it while I’m here. What delights are you dancing? Where summers are short, we must celebrate them intensely! Montreal knows this, and her people glory in markets and street life, exploding with fresh flavors and colors. I’ve taken you along, in an earlier post, to Atwater Market. 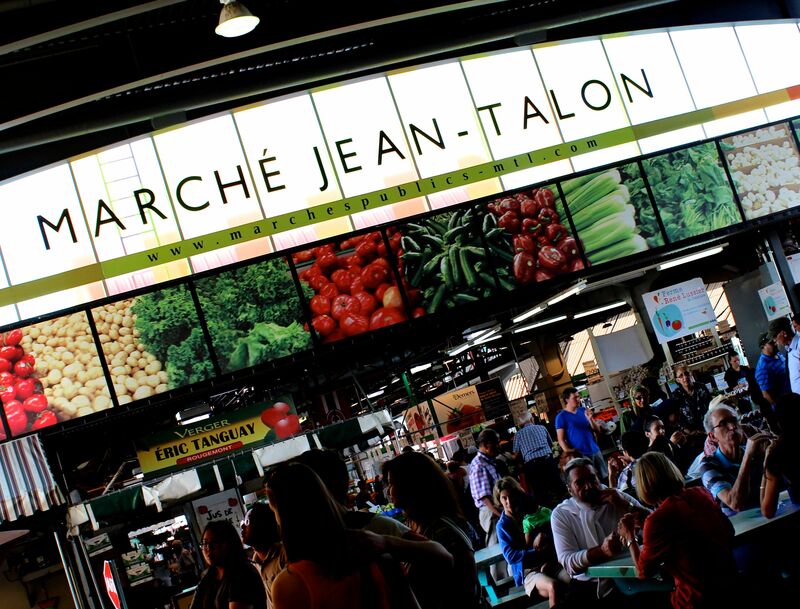 Today, we visit Marche Jean-Talon, with a stop in Vieux Montreal. 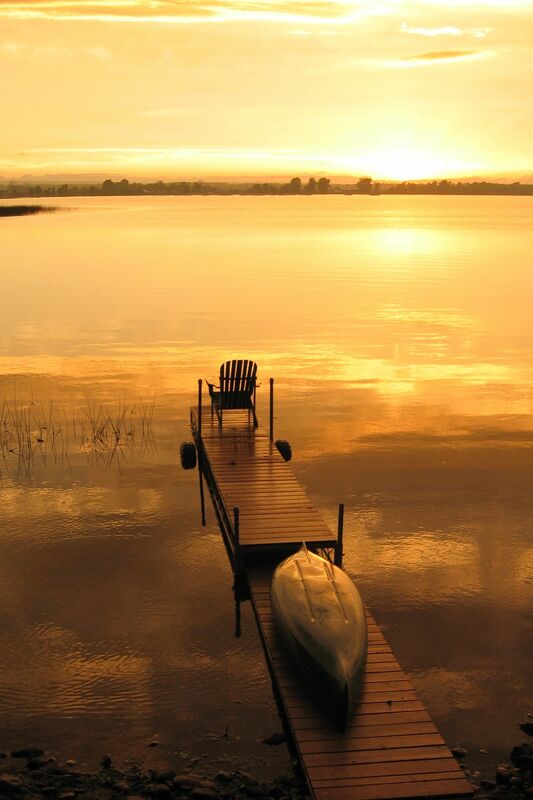 Whatever season currently prevails where you live, immerse yourself for a few moments in summer! Now that’s a summer eclair! Everywhere Peace . . . Everywhere peace, everywhere serenity, and a marvelous freedom from the tumult of the world.